Inflection 360 is a consulting partner to healthcare practices and business owners. We develop customized strategic plans and deliver actionable results to maximize client performance. While Inflection 360 has expertise across many industries of all sizes, we have developed a particular strength in healthcare. Our team has significant experience working with clients across an array of healthcare specialties, including dental and medical practices, surgery centers and other healthcare service businesses. While healthcare offers substantial opportunities, it also requires navigating challenging and changing regulatory considerations. Our hands-on healthcare experience and industry-leading knowledge sets us apart. Acquiring a business takes a diverse set of skills and knowledge. Inflection 360 has the expertise to successfully lead clients through the acquisition process. A successful exit strategy (typically a sale), takes planning and preparation. Inflection 360 will help you maximize value and achieve the best outcome. Do you have the right plan to grow your business? Inflection 360 collaborates with businesses to develop, refine and adjust plans for successful growth. Businesses must understand the competitive landscape and the landmines and opportunities that lie ahead. Inflection 360 can help. Businesses need to adapt to succeed. Whether your business is underperforming or successful, Inflection 360 can boost operational performance. Inflection 360 provides comprehensive insight and services to clients at the most critical points of their business life cycle. With strengths in multiple functional areas, Inflection 360 uses a hands-on approach to drive results and ensure success. An inflection point is a critical period in the life of a business. At this juncture, the ability to understand key alternatives, and act upon them, is essential. Some businesses may experience multiple differentiated inflection points, so having the right advisor is crucial. To provide the right advice, you must understand a business from multiple vantage points, both with an internal and external eye, to properly assess core business strengths, weaknesses and opportunities. Interested in Selling Your Practice or Business? 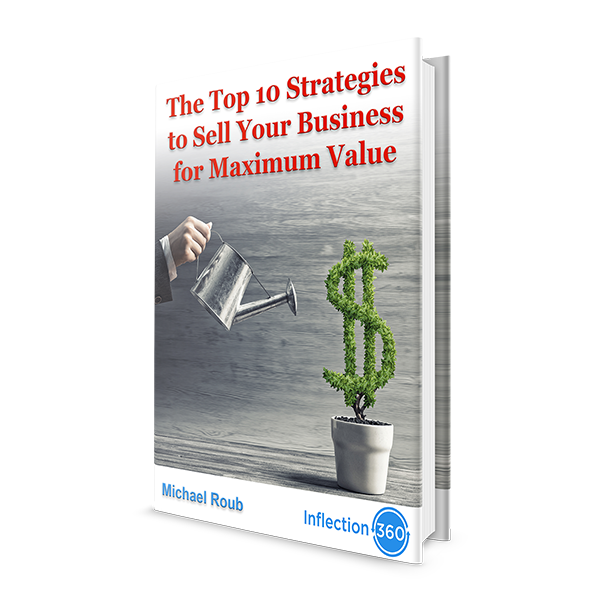 Inflection 360 has outlined 10 strategies to maximize value. Over the past two decades, Michael Roub has developed a reputation for providing critical insight and results for the clients and organizations he represents. Michael is committed to finding the right solution for each business and utilizes his diverse experience and a hands-on approach to deliver optimal results. Inflection 360 team members have worked in a variety of capacities in organizations to be able to address a broad spectrum of challenges and opportunities for our clients. Key functional expertise includes executive roles in operations, corporate strategy, finance, acquisitions, and business development, and corporate restructuring.